Melbourne’s street artists have been recreating it in tributes ever since Banksy’s “Little Diver” in Cocker Alley was destroyed in 2008. Earlier this year Sunfigo remembered Banksy’s “Little Diver” in a work that parodied the Melbourne City Council’s Laneway Commissions. Sunfigo is a good multi-layer stencil maker and knows Melbourne street art and graffiti history including references to HaHa, Hugh Dunit, Sync, Phibs, the notorious CCTV, and others, as well as, Banksy. 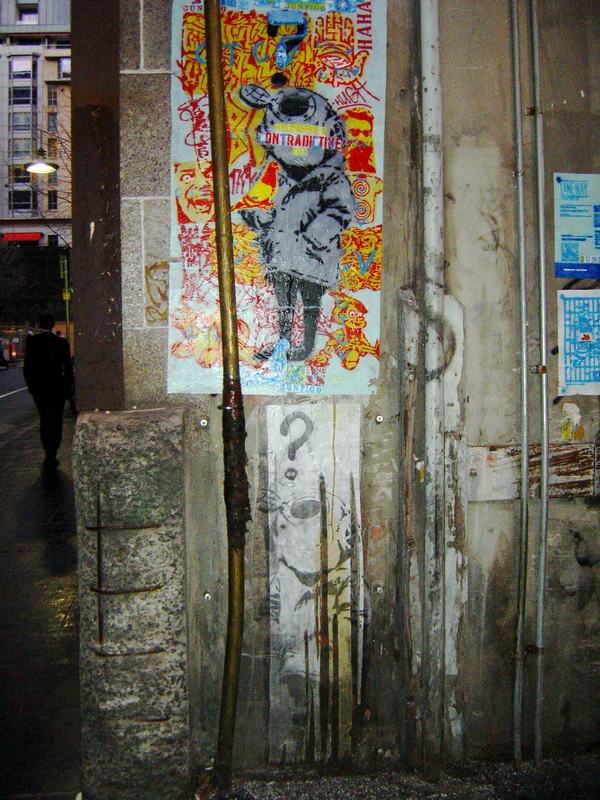 In 2010 another Banksy rat was destroyed in Hosier Lane, local street artists reproduced it and added other work commenting on it. (See my blog post: Street Art Notes July) Do all of these tributes to Banksy really contribute anything to Melbourne’s street art? Even though the tributes to Banksy by Phoenix, Sunfigo and Bados are all quality and nuanced works of art but repeating the legend of Banksy is not the subject of significant art. Apart from serving as a reminder of the hypocrisy of Melbourne City Council towards street art – and politicians eat hypocrisy for breakfast. There is an element of the cultural cringe in both the council and Melbourne street artist’s continual celebration of a visiting British artist. Rather than dwelling on the past maybe these artists should think about the future of street art in Melbourne. Street art is ephemeral and has little room for history – maybe it’s time to forget about Banksy. This entry was posted on Monday, July 16th, 2012 at 9:55 PM	and tagged with Bados Earthling, Banksy, Melbourne, paste-ups, performance art, Phoenix, Sunfigo and posted in Street Art. You can follow any responses to this entry through the RSS 2.0 feed. Hi Mark, I agree with your sentiments. To me, street art is a progressive and ever changing art form. It seems to go against the very nature of ‘street’ to constantly revel in the past. Thanks Dave, thinking about it further it seems to go against the anonymous and the ephemeral nature of street art to revel in a “great man”. Hi Dean, I don’t think I have a pic of that piece by Calm. Your the one that posts all the pics while I complain that there is too many on this subject.